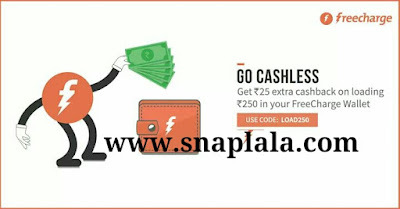 Freecharge offering Rs.25 Cashback on Adding Rs.250 or more. Freecharge Coupons and Cashback Offers are a great way to save on your Recharges and bill payments. Use these Freecharge Coupons and Offers and avail coupon discounts and cashbacks on your recharges. In this post we will get you updated about the latest Offers from Freecharge and also Give some exclusive Offers which can make your recharge experience more delightful. 6. Rs 25 cashback will be credited to Freecharge account instantly.